In this chapter we will discuss exceptions in the object-oriented programming and in C# in particular. We will learn how to handle exceptions using the try-catch construct, how to pass them to the calling methods and how to throw standard or our own exceptions using the throw construct. We will give various examples for using exceptions. We will look at the types of exceptions and the exceptions hierarchy in the .NET Framework. At the end, we will look at the advantages of using exceptions, best practices and how to apply them in different situations. When we write a program, we describe step-by-step what the computer must do (at least in imperative programming; in the functional programming things look a bit different) and in most of the cases we rely that the program will execute normally. Indeed, most of the time, programs are following this normal pattern, but there are some exceptions. Let’s say we want to read a file and display its contents on the screen. Let’s assume the file is located on a remote server and during the process of reading it, the connection goes down. The file then will be only partially loaded. The program will not be able to execute normally and show file’s contents on the screen. In this case, we have an exception from the normal (and correct) program execution and this exception must be reported to the user and/or the administrator. Exception is a notification that something interrupts the normal program execution. Exceptions provide a programming paradigm for detecting and reacting to unexpected events. When an exception arises, the state of the program is saved, the normal flow is interrupted and the control is passed to an exception handler (if such exists in the current context). Exceptions are raised or thrown by programming code that must send a signal to the executing program about an error or an unusual situation. For example, if we try to open a file, which doesn’t exist, the code responsible for opening the file will detect this and will throw an exception with a proper error message. Exceptions are one of the main paradigms of object-oriented programming (OOP), which is described in details in the chapter "Object-Oriented Programming Principles". Exception handling is a mechanism, which allows exceptions to be thrown and caught. This mechanism is provided internally by the CLR (Common Language Runtime). Parts of the exception handling infrastructure are the language constructs in C# for throwing and catching exceptions. CLR takes care to propagate each exception to the code that can handle it. In Object-Oriented Programming (OOP), exceptions are a powerful mecha­nism for centralized processing of errors and exceptional situations. This mechanism replaces the procedure-oriented method of error handling in which each function returns a code indicating an error or a successful execution. Usually in OOP, a code executing some operation will cause an exception if there is a problem and the operation could not be successfully completed. The method causing the operation could catch the exception (and handle the error) or pass the exception through to the calling method. This allows handling errors to be delegated to some upper level in the call stack and in general, allows flexible management of errors and unexpected situations. Another fundamental concept is exceptions hierarchy. In OOP, exceptions are classes and they can be inherited to build hierarchies. When an exception is handled (caught), the handling mechanism could catch a whole class of exceptions and not just a particular error (as in the traditional procedural programming). In OOP, it is recommended to use exceptions for managing error situations or unexpected events that may arise during a program execution. This replaces the procedural error-handling approach and gives important advantages such as centralized error processing, handling multiple errors in one place and ability to pass errors to a higher-level handler. Another important advantage is that exceptions self-describe themselves and can create hierarchies. Sometimes exceptions are used not so much to signal a problem but to handle some expected event. This is not considered a good practice as exceptions should not control the normal flow of the program. At the end of the chapter we will look in more details into this. 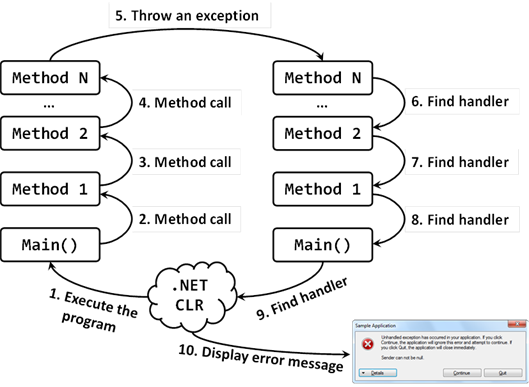 Exception in .NET is an object, which signals an error or an event, which is not anticipated in the normal program flow. When such unusual event takes place, the executing method ’throws' a special object containing information about the type of the error, the place in the program where the error occurred as well as the program state at the moment of the error. Each exception in .NET contains the so-called stack trace, which gives information of where exactly the error occurred. This will be discussed in more details later in this chapter. In this example, we have a code trying to open a text file for reading and then display the first line of this file on the screen. We will discuss working with files in more details in the chapter "Text Files". The first two lines of ReadFile() contain code that throws an exception. In this example, if the file WrongTextFile.txt doesn’t exist, the constructor StreamReader(string, fileName) will throw a FileNotFoundException. If an unexpected problem occurs during the input-output operations, the stream methods, such as ReadLine() will throw an IOException. The code above will successfully compile but at run-time it will throw an exception if the WrongTextFile.txt file does not exist. The end result in this case is an error message displayed on the console. The console output also contains information of where and how the error occurred. If this line triggers an error, the reader local variable will not be initialized and it will have its default value of null. None of the lines that follow in the method will be executed. The program will be interrupted until the CLR finds a handler that can process the exception. After a method throws an exception, CLR is looking for an exception handler that can process the error. To understand how this works, we will take a closer look on the concept of a call-stack. The program call-stack is a stack structure that holds information about method calls, their local variables, method parameters and the memory for value types. .NET programs start from the Main(…) method, which is the entry point of the program. Another method, let’s name it "Method 1" could be called from Main. Let "Method 1" call "Method 2" and so on until "Method N" is called. When "Method N" finishes, the program flow returns back to its calling method (in our example it would be "Method N-1"), then back to its calling method and so on. This goes on until the Main(…) method is reached. Once Main(…) finishes, the entire program exits. The general principle is that when a new method is called, it is pushed on top of the stack. When the method finishes, it is pulled back from the stack. At any given point in time, the call-stack contains all the methods called during the execution – from the starting method Main(…) to the last called method, which is currently executing, along with their local variables and arguments taken as input. The exception handling mechanism follows a reversed process. When an exception is thrown, CLR begins searching an exception handler in the call-stack starting from the method that has thrown the exception. This is repeated for each of the methods down the call-stack until a handler is found which catches the exception. If Main(…) is reached and no handler is found, CLR catches the exception and usually displays an error message (either in the console or in a special error dialog box). The try-catch construct consists of one try block and one or more catch blocks. Within the try block we put the code that could throw exceptions. The ExceptionType in the catch block must be a type, derived from System.Exception or the code wouldn’t compile. The expression within brackets after catch is also a declaration of a variable, thus inside the catch block we can use objectName to use the properties of the exception or call its methods. Let’s now modify the code in our previous example to make it handle its exceptions. To do this, we wrap the code that could create problems in try-catch and then we add catch blocks to handle the two types of exceptions we know could arise. The file 'WrongTextFile.txt' is not found. In this case, we display the exception stack trace on the standard output. The lines between where the exception is thrown and the catch block that processed it are not executed. Showing the full information about the exception to the end user is not always a good practice! We will discuss the best practices in exception handling later in this chapter. The stack trace contains detailed information about the exception including where exactly it occurred in the program. The stack trace is very useful for programmers when they try to understand the problem causing the exception. The information in the stack trace is very technical and is designed to be used by programmers and system administrators and not by the end users. During debugging the stack trace is a priceless tool. Unhandled Exception: System.IO.FileNotFoundException: Could not find file '…\WrongTextFile.txt'. The system cannot find the file named “WrongTextfile.txt” and the FileNotFoundException is thrown. To be able to use the stack trace, we must be familiar with its structure. The line numbers are included only if the respective class is compiled with debug information (this information contains line numbers, variable names and other technical information). The debug information is not included in the .NET assemblies but is in separate files called 'debug symbols' (.pdb). As you can see in the example stack trace, debug information is available for some assemblies, while for others (like the .NET assemblies) it is not. This is why some entries in the stack trace have line numbers and others – not. If the method throwing the exception is a constructor, then instead of method name, the stack trace contains the word .ctor, like in System.IO. This rich information in the stack trace allows quickly and easily to find the class, the method and even the source line where the error has occurred. Then usually it is relatively straightforward to analyze the problem causing the error and fixing it. This is not the same in primitive languages such as C and Pascal where the concept of stack trace is not supported. Exceptions in C# are thrown using the keyword throw. We need to provide an instance of the exception, containing all the necessary information about the error. Exceptions are normal classes and the only requirement is that they inherit directly or indirectly from the System.Exception class. As all of these classes have different characteristics, we will examine them one by one. In .NET Framework, Exception is the base class for all exceptions. Several classes inherit directly from it, including ApplicationException and SystemException. These two classes are base classes for almost all exceptions that occur during the program execution. The Exception class contains a copy of the call-stack at the time the exception instance was created. The class also has a (usually) short message describing the error (filled in by the method throwing the exception). Every exception could have a nested exception also sometimes called an inner exception, wrapped exception or internal exception. The ability to wrap an exception with another exception is very useful in some cases and allows exceptions to be linked in the so called exception chain. The full specification of the Exception class given above is complex to be explained, so we will discuss only its most important methods and properties as they are inherited by all exceptions in .NET Framework. - We have three constructors with different combinations for message and inner exception. - The Message property returns a text description of the exception. 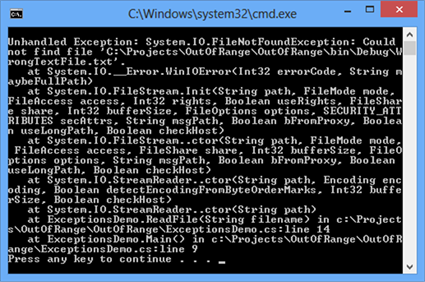 For example if the exception is FileNotFoundException, the message could provide information which file was not found. In most of the cases, the code throwing the exception passes the message in the constructor. Once set, the Message property cannot be changed. - The InnerException property returns the inner (wrapped, nested) exception or null if such doesn’t exist. - The GetBaseException() returns the innermost exception from a given exception chain. By definition, calling this method for every exception within an exception chain will always yield the same result – the first exception that happened. - The StackTrace property returns information for the entire stack contained in the exception (we have already seen how this information looks like). Exceptions in .NET are two types – system and application. System exceptions are defined in .NET libraries and are used by the framework, while application exceptions are defined by application developers and are used by the application software. When we, as developers, design our own exception classes, it is a good practice to inherit from ApplicationException and not directly from SystemException (or even worse – directly from Exception). SystemException should only be inherited internally within the .NET Framework. Some of the worst system exceptions include ExecutionEngineException (which is thrown on internal error within CLR), StackOverflowException (call-stack overflow, most probably due to infinite recursion) and OutOfMemoryException (insufficient memory). In all of these cases, our application could hardly recover or react in some reasonable manner. Most frequently, when such exception occurs, the application just crashes. Exceptions related to interaction with external components (like COM components) inherit from ExternalException. Examples are COMException and Win32Exception. Let’s look in more details at throwing and catching exceptions. We’ve already seen that each exception could contain a nested (inner) exception. Let’s explain in more details why it is a common practice in OOP error handling to wrap exceptions in this way. In software engineering, it is a good practice for every software component to define small number of specific application exceptions. The component then would throw only these specific application exceptions and not the standard .NET exceptions. In this way the users of the software component would know what exceptions could expect from it. For instance, if we have a banking software and we have a component dealing with interests, this component would define (and throw) exceptions like InterestCalculationException and InvalidPeriodException. The interest component should not throw exceptions like FileNotFoundException, DivideByZeroException and NullReferenceException. When an error occurs, which is not directly related to interest calculation, the respective exception is wrapped in InterestCalculationException and the calling code will be informed that the interest calculation was not correctly done. Still, these business application exceptions usually do not have detailed technical information about the nature of the problem. This is why, it is considered a good practice to include technical details about the problem and this is where inner exceptions come in handy. When the component throws its application exception, it should keep the original exception as an inner exception in order to preserve the technical details about the error. Another example is when a software component (let’s call it Component A) defines its own application exceptions (A-exceptions). This component internally uses another component (called Component B). If for some reason B throws a B exception (an exception defined in B), perhaps A will have to propagate the error because it will not be able to do its task. And because A cannot simply throw a B-exception, it must throw an A-exception, containing the B-exception as a nested exception. - Component A users are not prepared to receive Component B exceptions. They expect component A exceptions only. How to Read the Stack Trace with Nested Exceptions? In this example, we call the ReadFile() method (line 42), which will throw an exception (line 51) because the file "WrongFileName.txt" does not exist. In the Main() method we catch all exceptions (line 44), wrap them into a new exception of type ApplicationException and throw them again (line 46). As we shall see later in the section "Grouping Different Error Types", caching an Exception also catches all its descendant exceptions in its hierarchy. 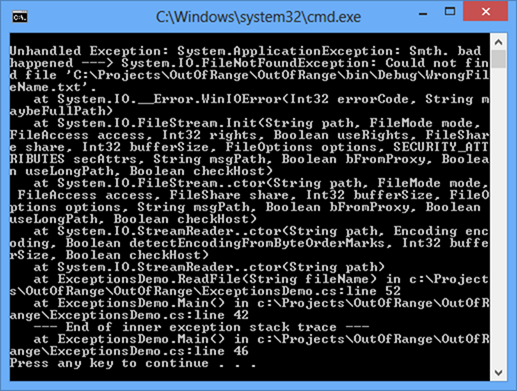 Finally the thrown exception (at line 46) is caught by .NET Framework and its stack trace is dumped on the console. This gives useful information about how the exception was thrown. This shows that an exception of type Exception1 is wrapped around an exception of type Exception2. After each exception type, we can see the message of the respective exception (as contained in the Message property). Using the information in the stack-trace (the file name, the method and the line number), we can find out how the exceptions occurred and where. In console applications errors are usually printed in the output although this might not be the most user-friendly way to notify the user for problems. In Web applications, errors are frequently shown in the beginning or at the bottom of the page or near the UI field related to the error. As you can see, there is no single 'right' way to handle and visualize exceptions as it depends on the type of the application and its intended audience. Still there are some recommendations regarding how to handle exceptions and what is the best way to show them to the users. We will discuss these recommendations in the "Best Practices" section. Which Exceptions to Handle and Which Not? A method should only handle exceptions which it expects and which it knows how to process. All the other exceptions must be left to the calling method. If we follow this rule and every method leaves the exceptions it is not competent to process to the calling method, eventually we would reach the Main() method (or the starting method of the respective thread of execution) and if this method does not catch the exception, the CLR will display the error on the console (or visualize it in some other way) and will terminate the program. A method is competent to handle an exception if it expects this exception, it has the information why the exception has been thrown and what to do in this situation. If we have a method that must read a text file and return its contents as a string, that method might catch FileNotFoundException and return an empty string in this case. Still, this same method will hardly be able to correctly handle OutOfMemoryException. What should the method do in case of insufficient memory? Return an empty string? Throw some other exception? Do something completely different? So apparently the method is not competent to handle such exception and thus the best way is to pass the exception up to the calling method so it could (hopefully) be handled at some other level by a method competent to do it. Using this simple philosophy allows exception handling to be done in a structured and systematic way. Every exception which is not handled in Main() is eventually caught by the CLR and visualized by printing the stack trace on the console output or in some other way. While for small applications it is not such a problem, big and complex applications generally should not crash in such ungraceful manner. In this example the ReadFile() method catches and handles only FileNotFoundException while passing all other exceptions up to the Main() method. In the Main() method we handle only exceptions of type IOException and will let the CLR to handle all other exceptions (for instance, if OutOfMemoryException is thrown during program’s execution, it will be handled by the CLR). If the Main() method passes a wrong filename, FileNotFoundException will be thrown while initializing the TextReader in ReadFile(). This exception will be handled by the ReadFile() method itself. If on the other hand the file exists but there is some problem reading it (insufficient permissions, damaged file contents etc. ), the respective exception that will be thrown will be handled in the Main() method. Handling exceptions at different levels allows the error conditions to be handled at the most suitable place for the particular error. This allows the program code to be clear and structured and the flexibility achieved is enormous. Every try block could contain a respective finally block. The code within the finally block is always executed, no matter how the program flow leaves the try block. This guarantees that the finally block will be executed even if an exception is thrown or a return statement is executed within the try block. The code in the finally block will not be executed if while executing the try block, CLR is unexpectedly terminated, e.g. if we stop the program through Windows Task Manager. Every try block may have zero or more catch blocks and at most one finally block. It is possible to have multiple catch blocks and a finally block in the same try-catch-finally construct. When Should We Use try-finally? In many applications we have to work with external for our programs resources. Examples for external resources include files, network connections, graphical elements, pipes and streams to or from different hardware devices (like printers, card readers and others). When we deal with such external resources, it is critically important to free up the resources as early as possible when the resource is no longer needed. For example, when we open a file to read its contents (let’s say to load a JPG image), we must close the file right after we have read the contents. If we leave the file open, the operating system will prevent other users and applications to make certain operations on the file. Perhaps you faced such a situation when you could not delete some directory or a file because it is being used by a running process. The finally block is priceless when we need to free an external resource or make any other cleanup. The finally block guarantees that the cleanup operations will not be accidentally skipped because of an unexpected exception or because of execution of return, continue or break. Because proper resource management is an important concept in programming, we will look at it in some more details. - An exception could be thrown when the reader is initialized (say if the file is missing). - During reading the file, an exception could arise (imagine a file on a remote network device which goes offline during file reading). - A return statement could be executed before the reader is closed (in our trivial example this would be obvious but it is not always as apparent). - Everything goes as expected and the method is executed normally. So our method as written in the example above has a critical flaw: it will close the reader only in the last scenario. In all of the other cases, the code closing the reader will not be executed. And if this code is within a loop, things get even more complex as continue and break operators must be considered too. In the previous section we explained the fundamental flaw of the solution 'open the file à read à close'. If an error occurs during opening or reading the file, we will leave the file open. To solve this, we can use the try-finally construct. We will first discuss the case in which we have one resource to clean-up (in this case a file). Then we will give an example when we have two or more resources. In this example we first declare the reader variable, and then initialize the TextReader in a try block. Then in the finally block we close the reader. Whatever happens during TextReader’s initialization or during reading, it is guaranteed that the file will be closed. If there is a problem initializing the reader (say the file is missing), then reader will remain null and this is why we do a check for null in the finally block before calling Close(). If the value is indeed null, then the reader has not been initialized and there is no need to close it. The code above guarantees that if the file has been opened, then it will be closed no matter how the method exits. The example above should, in principle, properly handle all exceptions related to opening and initialization of the reader (like FileNotFoundException). In our example, these exceptions are not handled and are simply propagated to the caller. We have chosen file streams for our example for freeing resources up but the same principle applies to all resources that require proper cleanup. These could be remote connections, operating system resources, database connections and so on. This code has the advantage of being simpler and shorter. We avoid the preliminary declaration of the reader variable and the check for null in the finally block. The null check is now not necessary because the initialization of the reader is outside of the try block and if an exception occurs during the initialization, the finally block will not be executed at all. This code is cleaner, shorter and clearer and is known as "dispose pattern". However, note that this way the exception will go up to the method calling ReadFile(…). Sometimes we need to free more than one resource. It is a good practice to free the resources in in reverse order in respect to their allocation. Both of these options are correct and both are applied depending on the situation and programmer’s preference. The second approach is a little bit riskier as if an exception occurs in the finally block, some of the resources will not be cleaned up. In the example above, if an exception is thrown during r1.Release(), r2 will not be cleaned up. If we use the first option, there is no such problem but the code is a bit longer. It is time to present a new shorter and simplified way to release some kinds of resources in C#. We will demonstrate which resources can use this special programming construct and how it looks like. The main use of IDisposable interface is to release resources. In .NET such resources are window handles, files, streams and others. We will talk about interfaces in “OOP Principles” chapter. Now we may consider interface as an indication that given type of objects (for example streams for reading files) support a certain number of operations (for example closing the stream and releasing related resources). We will not go into details how to implement IDisposable since we have to go much deeper and explain how the garbage collector works, how to use destructors, unmanaged resources and so on. The above simplified form of the "dispose pattern" is simple to write, simple to use and simple to read and is guaranteed to release correctly the allocated resources specified in the brackets of the using statement. It is not necessary to have try-finally or to explicitly call any method to release the resources. The compiler takes care to automatically put try-finally block and the used resources are released by calling the Dispose() method after leaving the using block. Later in chapter "Text Files" we will extensively use the using statement to correctly read and write text files. It is important to mention that using statement is not related to exception handling. Its only purpose is to release the resources no matter whether exceptions are thrown or not. It does not handle exception. When to Use the "using" Statement? Use the using statement with all classes that implement the IDisposable interface. Look for IDisposable in MSDN. When a class implements IDisposable interface this means that the creator of this class expects it can be used with the using statement and the class contains some expensive resource that should not be left unreleased. Implementing IDisposable also means that it should be released immediately after we finish using the class and the easiest way to do this in C# is with using statement. So far we reviewed the exceptions in details, their characteristics and how to use them. Now let’s find out why they were introduced and why they are so widely used. - What will happen if the file does not exist? - What will happen if the file cannot be opened? - What will happen if reading a line fails? - What will happen if the file cannot be closed? Let’s change the method having these questions in mind without using exceptions. Let’s use error codes returned by any method that we use. Using error codes is standard way for handling errors in procedure oriented programming, where every method returns int, which provides information whether the method was executed correctly. Error code 0 means that everything is correct. Any other code means some error. Different kinds of errors have different codes (usually it is a negative number). As a result we have a hard to understand and easy to break “spaghetti” code. Program logic is mixed with the error handling logic. Big parts of the code are the rules for error handling. Errors don’t have type, description or stack trace and we have to wonder what the different error codes mean. In fact exceptions don’t save us the effort in finding and processing errors but give us more elegant, short, clear and efficient way to do it. The hierarchical nature of exceptions allows us to catch and handle whole groups of exceptions at one time. When using catch we are not only catching the given type of exception but the whole hierarchy of exception types that are inheritors of the declared type. The example above will catch not only the IOException, but all of its descendants including FileNotFoundException, EndOfStreamException, PathTooLongException and many others. In the same time exceptions like UnauthorizedAccessException and OutOfMemoryException will not be caught, because they don’t inherit from IOException. We can look in MSDN for the exceptions hierarchy if we wander which exceptions to catch. Catching Exception and all of its inheritors is not a good practice. It is better to catch more specific groups of exceptions like IOException or just one type of exception like for example FileNotFoundException. First in Method1() we have to analyze the error code returned by ReadFile() method and eventually pass it to Method2(). In Method2() we have to analyze the error code returned by Method1() and eventually pass it to Method3() where to handle the error itself. If an error occurs during reading the file it will be ignored in Method1() and Method2() and will be caught and handled in Method3() where is the most appropriate place to handle the error. Let’s remember again the most important rule: every method should catch only exceptions that can handle and skip all the others. In this section we will give some recommendations and best practices for correctly using exceptions for error handling and unexpected situations. These are important rules that should be remembered and followed. When to Rely on Exceptions? To understand when it is good to rely on exceptions let’s see the following example: we have a program that opens a file by given path and file name. While writing the user can write the file name wrong. This should rather be considered normal and not exceptional. The file 'WrongTextFile.txt' does not exist. We can consider the second option as worse because exceptions should be used for unexpected situations and missing file is more or less usual. It is not a good practice to rely on exceptions for expected events for another reason: performance. Throwing an exception is time consuming operation. An object has to be created to hold the exception, the stack trace has to be initialized and handler for this exception has to be found and so on. It is hard to define the exact border between expected and unexpected. In general expected event is something related to the program functionality. Input of wrong file name for example. Power cut during the execution of the program, from the other hand, is unexpected event. Throw Exceptions to the End User? Exceptions are confusing for most users. They give the impression of a poorly written program that “has bugs”. What will the user of our application entering invoices think if suddenly the program shows this dialogue? This dialogue is very suitable for a developers or administrators for example, but it is extremely inappropriate for the end users. This is the good way to show the error message to the end user. The message is easy to understand from the user and also contains technical details that can be used if required but is not visible at the beginning. It is recommended when exceptions are not caught by anyone (such exceptions can only be runtime errors) to be caught by a global exception handler which saves them on the disk and shows user friendly message such as “An error occurred, please try again later”. It is a good a practice to show not only a user friendly message but also technical information (stack trace) available on demand (e.g. through an additional button or link). Throw Exceptions at the Appropriate Level of Abstraction! When we throw our own exceptions we must keep in mind the abstractions in the context our methods work. For example if our method works with arrays we can throw IndexOutOfRangeException or NullReferenceException because our method works at low level and directly operates with the memory and the array elements. But if our method is doing accumulating of interests at all accounts in a bank it should not throw IndexOutOfRangeException because this exception is not from the business area of the banking sector. It would be normal accumulation of interests in a bank software to throw InvalidInterestException exception with an appropriate error message where the original IndexOutOfRangeException exception to be attached. Let’s give another example: we call a method that sorts an array of integers and throws an exception TransactionAbortedException. This is also an inappropriate exception just as NullReferenceException was in accumu­lation of interests in the bank software. That is why we should consider the abstraction level where our method works when we throw our exception. If Your Exception Has a Source, Use It! When we catch an exception and throw a new one with a higher level of abstraction we should always attach the original exception to it. This way the user of our code will be able to easily find the exact reason for the error and the location where it occurred at the first place. Each exception should carry detailed information about the problem. From the rule above many more rules come out: we should have a relevant error message, the error type should match the problem and the exceptions should hold its source as inner exception. Give a Detailed Descriptive Error Message! The error message that every exceptions holds is extremely important. In most cases it is enough to give us information what is the problem. If the message is not good enough the users of your methods will not be able to quickly solve the problem. Is this enough to find the problem? Obviously not. What should be the message so it is descriptive enough? Is this one better? This error message is better because it tells us which file caused the problem (something that would save us time, especially if we are not familiar with the application and don’t know where it keeps its settings files). Error reading settings file: C:\Users\Administrator\MyApp\MyApp.settings. Number expected at line 17. This message fully describes the problem. Obviously we have an error on line 17, in MyApp.settings file, which is in C:\Users\Administrator\MyApp folder. On this line a number is expected but is not provided. If we open the file we could quickly find the problem. Always give adequate, detailed and correct error message when throwing exceptions! The user of your code should be able to tell what and where is the problem and what caused it when reading the error message. - We have a method that searches for an integer in an array. If it throws IndexOutOfRangeException it is important to mention the index that cannot be reached in the error message. For example index 18 when the length of the array is 7. If we don’t know the position we will hardly understand why we are outside the array. - We have a method that reads integers from a file. If in the file we have a row without an integer we should get an error, which explains that at row 17 for example an integer is expected instead of a string (and prints the string). Even worse than throwing an exception with not enough information is throwing one with wrong information. If in the last example we say the error is at row 3 instead of row 17 this will be misleading and will be worse than just showing an error and give no details. Be careful not to show messages with incorrect content! Use English for the error messages when throwing an exception. This rule is a sub-rule of the rule “use English in your entire source code. The reason: English is the only language that is understood by programmers around the world. One day your code could be used by foreigners. If you live in France you probably won’t be happy to get error messages in Chinese and vice-versa, would you? 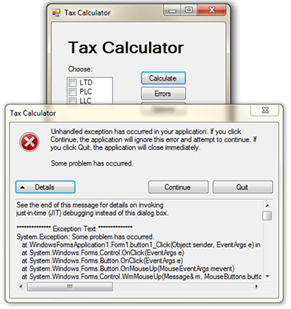 Note that error messages shown to the end user could be in his native language, but the error messages in the exceptions should always be in English. The exceptions are for the developer. The developers around the world use English. The messages (errors / notifications / warnings) for the end user are different story. These messages could be in the language which is best suited for the end-users and may be customized through localization techniques like resources, embedded resource files and resource strings (see http://msdn.microsoft.com/en-us/magazine/cc163609.aspx for additional information). Never Ignore the Exceptions You Catch! In the example the exception is caught and ignored. This means that if the file is missing the program will not read anything and there will not be any error message. This gives the user wrong impression the file is read when it is in fact missing. Don't do this! We can improve the code above by using Int32.TryParse(…) or by initializing the number variable with 0 in the catch block, not outside of it. In the second case the comment in the code and empty catch block are not necessary. Dump the Error Messages in Extreme Cases Only! Let’s take our method, which is reading the application settings from a file. If an error occurs it could print it in the console but what will happen with the calling method? It will suppose that the settings are read correctly. A method should either do the work it is created for or throw an exception. Any other behavior is incorrect! A method should either do the work it is created for or throw an exception. In case of wrong input the method should throw an exception and should not return a wrong result! We can explain the rule in details: A method is created to do a certain job. What the method is doing should be clear from its name. If we cannot give an appropriate name to the method means that it is doing many things and we should split it so everything is in separate method. If the method cannot do the work it is created for it should throw an exception. For example if we have a method for sorting of an array of integers. If the array is empty the method should either return an empty array or return an error. Wrong input should cause an exception and not return a wrong result! For example if we try to take a substring from index 7 to 12 from a string with length 10, it should cause an exception and not return fewer characters. This is how the Substring() method in String works. We will give another example, which confirms the rule that a method should do the work it is created for or throw an exception. Let’s suppose we copy a big file from the local disk to an USB flash drive. It could happen so that the space on the flash drive is not enough and the file cannot be copied. Which of the following is correct and the program for coping files (for example Windows Explorer) should do? - The file is not copied and no error message is shown. - The file is partially copied and no error message is shown. - The file is partially copied and error message is shown. - The file is not copied and error message is shown. From the user point of view the only correct behavior of the program is the last one: if a problem occurs the file should not be copied partially and an error message should be shown. We should do the same if we have to write a method that copy files. It should fully copy the given file or throw an exception. At the same time it should not leave any traces – it should delete any partial result if such was created. In the code we suppose that there is a method ReadFile(), which reads a text file and returns the content as string. The catch block catches all exceptions (regardless of their type), not only FileNotFoundException, and in all cases prints that file is not found. There are unexpected situations such as when file is locked by another process in the operating system. In such case the CLR will generate UnauthorizedAccessException, but the message that the program will show to the user will be wrong and misleading. The file exists but the program will claim it is not there. The same will happen when during the file opening we are out of memory and OurOfMemoryException is generated. The message will be incorrect again. Only Catch Exceptions You Know How to Process! We should handle only errors that we expect and we are prepared for. We should leave the other errors (exceptions) so they are caught by another method that knows how to handle them. A method should not catch all exceptions – it should only catch the ones it can process correctly. This is a very important rule that should be followed. If you don’t know how to handle an exception do not catch it or wrap it with your exception and pass it on for additional handling. 1. 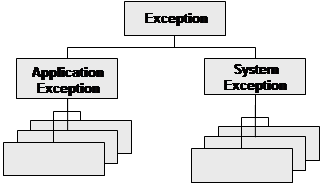 Find out all exceptions in the System.IO.IOException hierarchy. 2. Find out all standard exceptions that are part of the hierarchy holding the class System.IO.FileNotFoundException. 3. Find out all standard exceptions from System.ApplicationException hierarchy. 4. Explain the concept of exceptions and exception handling, when they are used and how to catch exceptions. 5. Explain when the statement try-finally is used. Explain the relationship between the statements try-finally and using. 6. Explain the advantages when using exceptions. 7. Write a program that takes a positive integer from the console and prints the square root of this integer. If the input is negative or invalid print "Invalid Number" in the console. In all cases print "Good Bye". 8. Write a method ReadNumber(int start, int end) that reads an integer from the console in the range [start…end]. In case the input integer is not valid or it is not in the required range throw appropriate exception. Using this method, write a program that takes 10 integers a1, a2, …, a10 such that 1 < a1 < … < a10 < 100. 9. Write a method that takes as a parameter the name of a text file, reads the file and returns its content as string. What should the method do if and exception is thrown? 10. Write a method that takes as a parameter the name of a binary file, reads the content of the file and returns it as an array of bytes. Write a method that writes the file content to another file. Compare both files. 11. Search for information in Internet and define your own class for exception FileParseException. 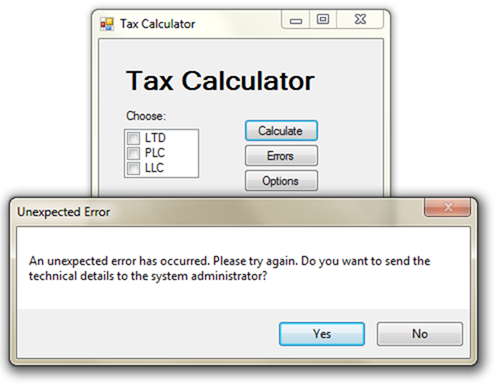 The exception has to contain the name of the processed file and the number of the row where the problem is occurred. Add appropriate constructors in the exception. Write a program that reads integers from a text file. If the during reading a row does not contain an integer throw FileParseException and pass it to the calling method. 12. Write a program that gets from the user the full path to a file (for example C:\Windows\win.ini), reads the content of the file and prints it to the console. Find in MSDN how to us the System.IO.File. ReadAllText(…) method. Make sure all possible exceptions will be caught and a user-friendly message will be printed on the console. 13. Write a program that downloads a file from Internet by given URL, e.g. https://softuni.bg/forum. 1. Search in MSDN. The easiest way to do this is to search in Google for "IOException MSDN" (without the quotes). 2. Look at the instructions for the previous task. 3. Look at the instructions for the previous task. 4. Use the information from the section “What Is an Exception?” earlier in this chapter. 5. When having difficulties use the information from the section "try-finally Construct". 6. When having difficulties use the information from the section "Exceptions Advantages". 8. When invalid number is used we can throw Exception because there is no other exception that can better describe the problem. As an alternative we can define our own exception class called in a way that better describes the problem, e.g. InvalidNumberException. 9. First read the chapter "Text Files". Read the file line by line with System.IO.StreamReader class and add the rows in System.Text. StringBuilder. Throw all exceptions from the method without catching them. You may cheat and solve the problem in one line of code by using the static method System.IO.File.ReadAllText(). - For reading use FileStream and write the data in a MemoryStream. You have to read the file in parts, for example on portions with 64 KB each, the last one can be smaller. byte buffer, int offset, int count). This method can read less bytes than requested. You have to write as many bytes as you read from the input stream. Create a loop that ends when zero bytes are read. - Use using to correctly closing the streams. Saving an array of bytes in a file is a simpler task. Open FileStream and start writing the bytes inside from the MemoryStream. Use using to correctly close the streams. Use a big ZIP archive to test (for example 300 MB). If the program is not working correctly it will break the structure of the archive and an error will occur when trying to open it. You can cheat by using the system methods System.IO.File. 11. Inherit from Exception class and add a constructor to it. For example FileParseException(string message, string filename, int line). Use this exception the same way as using any other exception. The number can be read with StreamReader class. 12. Search for all possible exceptions that the method could throw and for all of them define a catch block and print user-friendly message. 13. Search for articles in Internet for “downloading a file with C#” or search for information and examples about using the WebClient class. Make sure you catch and process all exceptions that can be thrown. Download the demo examples for this chapter from the book: Exception-Handling-Demos.zip.